ISBN 9780739032800. Did you beep when you should have bopped? Find a saxophone duet partner and learn to play jazz with more confidence. Includes 30 jazz rhythm challenges, eight practice duets, and nine extended performance duets at the intermediate level. The Eb parts are printed in the first half of the book and the Bb parts are printed in the second half - just mix and match! 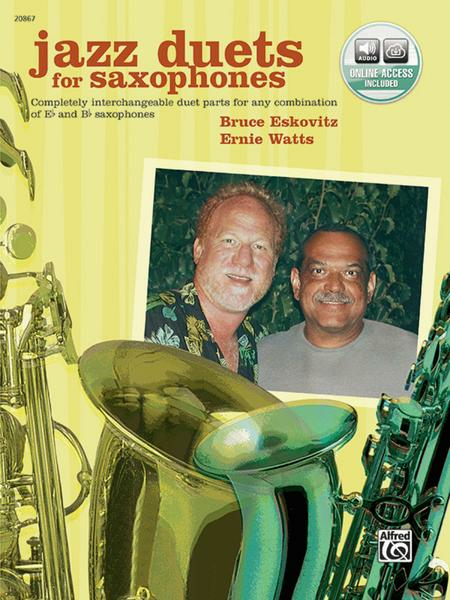 All selections are recorded on the play-along CD by saxophone greats Bruce Eskovitz and Ernie Watts.